MARTA train problems this week meant calling for an Uber driver for the ride to work. Keith arrived in a Toyota Prius, just three weeks in Atlanta after moving from Chicago, the mecca of city transit. He’s right. If you can manage to follow the twists and turns of various bus routes around the city, it’s apparent that there’s a clear lack of short and simple routes that run primarily on one street. Instead there are very long routes with low frequency that require studying a map to figure out where the bus actually goes. West Midtown to and from Georgia State University, anyone? Or generally, a quick way to get from apartments, nightlife, restaurants and Georgia Tech on the West Side to jobs and schools in downtown Atlanta (not to mention Five Points for rail access)? Here’s what that route might look like. Note: this is the old streetcar #1 route, serviced by MARTA bus 1, although that route is currently very long and no longer travels to downtown Atlanta. Bus rapid transit will likely be in Memorial Drive’s future. Until then, it’s great to imagine a frequent bus or shuttle from downtown that would service and connect Cabbagetown, Reynoldstown, East Lake, Kirkwood and Edgewood. The old streetcar route traveled on Memorial Drive to Arkwright and from there through downtown Kirkwood. Hip neighborhoods get connected with the city center via a John Wesley Dobbs/Irwin Street route. Whether on a private shuttle/trolley option or bus, travel from Peachtree Center to and from Krog Street Market. The BeltLine Eastside Trail, GSU Commons and many apartment buildings are also on this route, which would provide residents with a frequent transit option, and perhaps an incentive to leave the car at home. The former streetcar route on Ralph McGill (then Forrest Avenue) would be incredibly useful today. Connecting with Civic Center station, the route would travel to the Atlanta Medical Center, Old Fourth Ward and Old Fourth Ward Park (including all the many apartments and condos built or under construction nearby). Since this area is booming, instead of just back an forth on Ralph McGill, a loop using North Avenue would add service to Ponce City Market and other areas in Old Fourth Ward. (The original route traveled from Ralph McGill to Boulevard then north to Piedmont Park and Orme Circle). The artsy and historic Castleberry Hill neighborhood needs more frequent transit, especially with the new stadium bringing football fans and new hotels to the area. 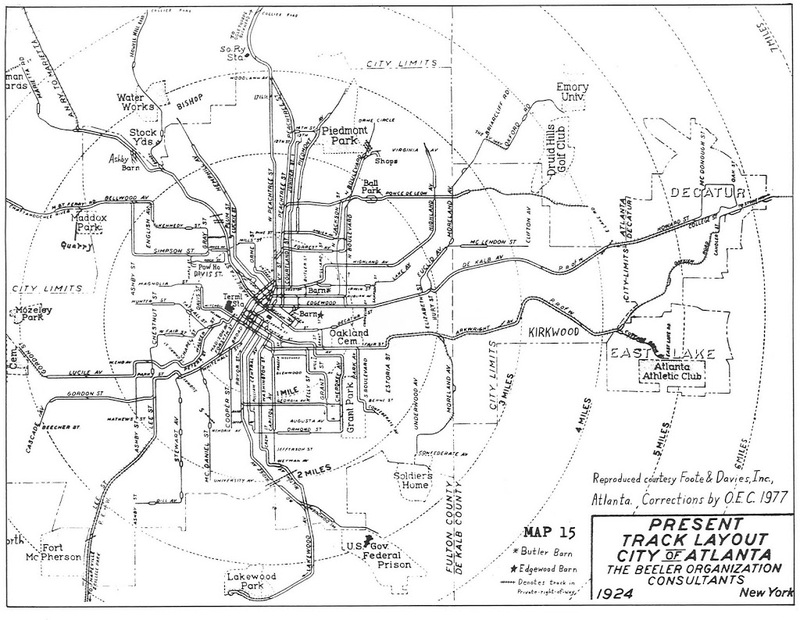 Mimicking a similar streetcar route from 1924, a neighborhood shuttle or bus service could connect the Dome MARTA station and Centennial Park with the new stadium, Castleberry Hill and the Atlanta University Center. A win for locals and tourists.